"The V8 Affair" by Ray Miller. 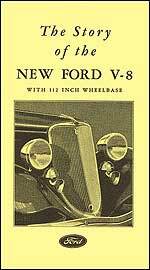 This hardback volume is the authoritative pre-war Ford V-8 history from the famous "Ford Road" series. Inside, you'll see a year-by-year breakdown of the changes in the cars, with an entire chapter devoted to each year. 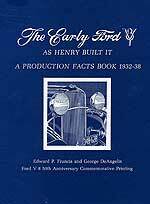 This book covers tons of information on Ford production from 1932-1938. A superbly illustrated book with an incredible amount of details on Ford production. The Flathead V8 Builder's Handbook by Frank Oddo has a wealth of tips on rebuilding Ford & Mercury Flathead V8's for stock and high performance. It also covers boring, stroking, porting and relieving. 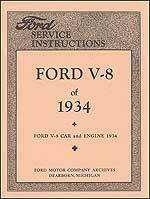 For Ford V8 of 1933. Covers in great detail those problem areas known to require maintenance. Contains reprints of service bulletins volume 14, numbers 1-5. 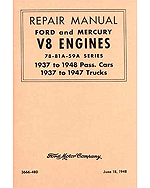 Information for the repair or overhaul of Mercury and Ford V8 engines (except 60 hp) manufactured from 1937-1948, inclusive. Intended for use by everyone, the instructions begin with the engine removed from the vehicle. Covers complete repair. 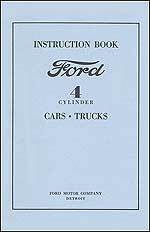 "Ford V8 1932 and 1936 Engine & Chassis Repair Manual"
This is a high quality reprint of the manual that ford mechanics used for the basics in servicing vehicles. 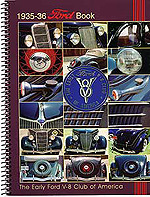 "Ford V8 1937 and 1938 Engine & Chassis Repair Manual"
"Ford V8 1939 and 1940 Engine & Chassis Repair Manual"
"Ford V8 Service Bulletins 1932-1937 Complete." 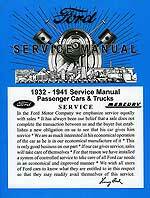 This hardback manual is a high-quality reproduction of a complete set of the service bulletins printed by Ford to help Ford mechanics at the dealer repair cars and trucks. 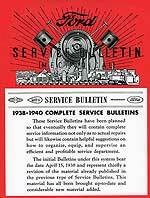 An assembly of the series of Service Bulletins originally issued periodically by the factory as a primary reference for the dealers. Includes specification changes and the story of how the V8 Ford came about. Cameo reproduction of showroom master catalog. 544 pages, 750 illustrations. Hardbound. 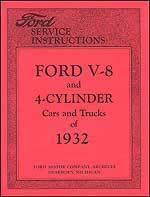 For 1932 Ford V8 and 4-cylinder cars and trucks. Includes reprints from Service bulletins Volume 13, Numbers 1 - 6/ 88 pages/ 142 illustrations. 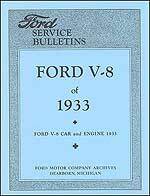 "Ford V8 Service Bulletins 1938-1940 Complete." 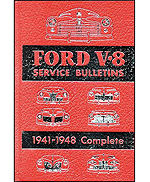 "Ford V8 Service Bulletins 1941-1948 Complete." 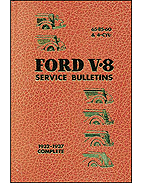 Features all bulletins for the line that would become Ford's final expression under the traditional chassis engineering guidelines. Covers all changes pertinent to production during these model years, and includes the supplementary Troubleshooting Bulletins series. 384 pages, 360 illustrations. Hardbound. Extremely detailed with instructions and illustrations. 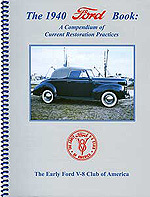 One of the best books available for mechanical restoration of the 1932-41 Ford and Mercury cars and trucks. Extremely detailed with instructions and illustrations. 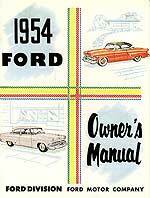 One of the best books available for mechanical restoration of the 1939-48 Ford and Mercury cars and trucks. 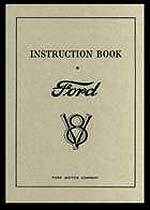 When you purchased your 1932 Ford brand new, this is the owner's handbook you would have received with the car. Covers all basic areas of maintenance, wiring, lubrication chart, brakes, shocks etc. 64 pages, soft bound. 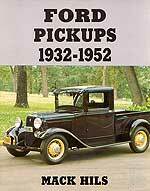 This book written by Mack Hills is a general reference book for all pickups from 1932-1952. Shows the changes and differences that occurred over the production years. A must have book for the pickup owner. This is a high-quality reproduction of the book that originally would have been used in the dealer's parts department so that customers could order body parts. Models 79A and 7GA/ with lubrication charts and simplified wiring diagrams/ a chapter on specifications/ hydraulic and hand brake system diagram. 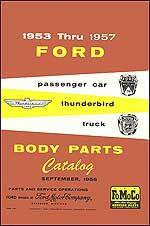 "1953 Thru 1957 Ford Passenger Car, Thunderbird, and Truck Body Parts Catalog." 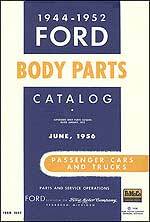 This is a reproduction of the book that originally would have been used in the dealer's parts department so that customers could order body parts. Shows all passenger model body styles as well as features for 1933/ foldout/ full-color/ 18" x 28" when unfolded. 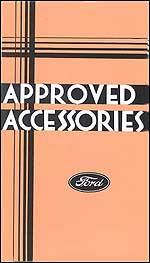 Shows genuine Ford accessories for 1933/ 3 color/ foldout/ 6" x 17" when unfolded. Booklet explains the new features for 1933, as well as engine specifications and improvements/ 12 pages in black and white. 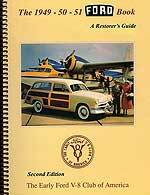 Shows all passenger body styles, as well as features for 1935/ 16 pages in full color. Shows new features and details/ 20 pages in 2 colors. 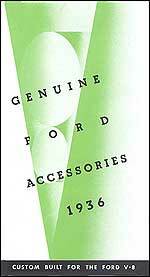 Shows genuine Ford accessories for 1936/ 2 color/ foldout. 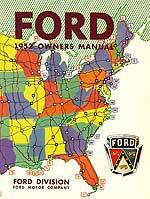 The 1932 Ford Book set. Two volumes with an all new look at the 1932 Ford. 620 pages loaded with over 900 photos, illustrations and drawings, many in color. Great reviews in several current car hobby magazines and periodicals. 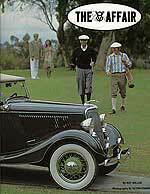 A must have book set for all early Ford V8 enthusiasts. 1940 Ford Restoration book. A compilation of 1940 Ford restoration practices. Spiral bound. 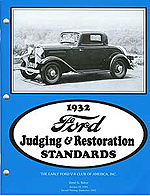 The Second Printing of the 1932 Ford Judging & Restoration Standards Book (September 2005) is now ready. This book duplicates the January 1981 book. 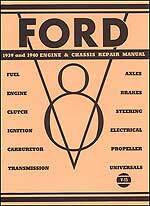 This is again, a great guideline for the 1932 Ford Car. 39 pages black & white. The unabridged reissue of the 1952 Shop manual and 1953-1954 Supplements in a combined permanent reference volume/ 560 pages/ 800 illustrations/ hardbound. 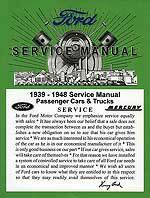 1935-1936 Ford Book Item No. 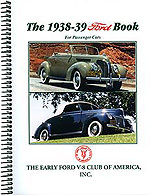 2001 This revised 1935-1936 Ford Book is now ready. 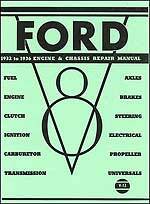 This is a great guideline for the 1935-1936 Ford Car. 164 pages, spiral bound. 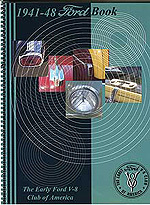 The owner's handbook/ with lubrication charts and detailed wiring diagrams/ covers instrument use, headlight alignment, distributor, carburetor, brakes, shocks, and more. This is the long-awaited, much anticipated 1937 Ford Book. This book contains an abundance of illustrated, detailed pages with chapters on Interior, Exterior, Engine Compartment, Upholstery Swatches, Chapters on the 85hp and 60hp Engines, Accessories and much more! 220 pages, spiral bound. 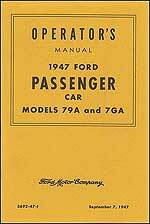 1938-1939 Ford passenger car Book. Spiral bound. 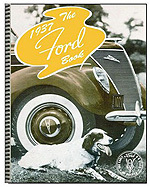 1941-1948 Ford Book Item No. 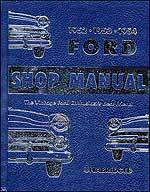 2006 The NEW 1941-1948 Ford Book is now ready. This is a new addition to the EFV8CA book list. 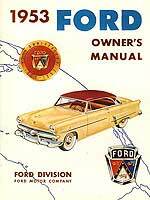 This is also a great guideline for the 1941-1948 Ford Car. Spiral bound. 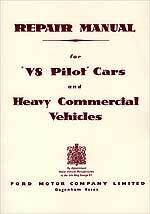 Full reprint of the famous V8 Pilot Repair Manual. 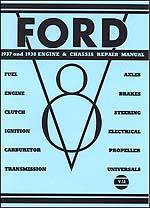 319 pages, packed with information on the complete aspects of mechanical repairs on this famous English Ford car and an absolute must have item for any V8 Pilot owner. 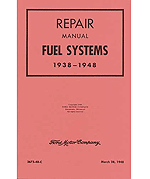 60 page manual covering fuel system, maintenance of carburetors and fuel pumps. Includes 4, 6, 8 & 12 cylinder cars and trucks.